“The outbreak of World War II in 1939 proved a pivotal juncture in modern Irish history, posing an existential threat to the diplomatic autonomy of the new country. Caught between Nazi aggression and British desperation, Taoiseach Eamon de Valéra nevertheless refused to abandon his prewar commitment to neutrality for the next six years. Although this stance enjoyed almost unanimous support within Irish borders, foreign observers were much less sympathetic,maintaining a bitter sense of recrimination that would persist long after the defeat of the Axis powers. 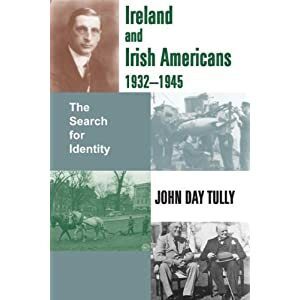 John Day Tully’s Ireland and Irish Americans 1932–1945 offers welcome insight into the role played by transatlantic relations during this dramatic test of Irish will. Drawing largely upon recently released state records, Tully identifies the wartime experience as the crucial moment of disengagement between Ireland and Irish America, following a period of shifting identities on each side of the Atlantic. The author’s discussion of Irish developments revisits a thirty year- old debate on the origins and motivations behind that country’s lasting commitment to neutrality, as Tully attributes this definitive stance to deValéra’s interwar attempt to create an independent role for Ireland on the world stage. At the same time, the author challenges the conventional notion that Irish- American identity lost its salience during the ethnic watershed of the 1920s, asserting instead that Irish Americans remained marginalized in the United States until World War II. . . .